Incontinence is not an easy condition to be diagnosed with. However Millions of people suffer from the condition and this number is expected to rise with the Baby Boomers getting older. The pelvic floor muscles will age and weaken over time and this is often what ends up causing you to have incontinence issues. Using Poise pads can help you to manage your condition without feeling embarrassed about it and will allow you to have confidence when you go out in public. Poise has an excellent series of adult pads that set the expectations that exist for adult incontinence pads. Poise pads are designed for the most outstanding security and comfort. They provide a safe barrier of moisture absorbing material that keeps the wearer safe from the potentially embarrassing incidents that can happen in public. Knowing that you are protected will boost your confidence and your self-esteem as well. 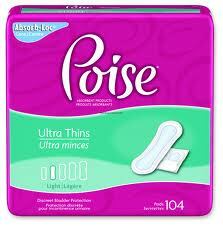 Poise pads are specifically designed for women. They assist in providing several different types of absorbency and protection to women “on the go”! They move with your body and do not allow urine to leak all over your body as the pad will collect it in a special moisture lock center. Keeping the urine on the pad and not on the skin or clothing is how you want a pad to work! Poise pads are not expensive either and they are simple to change out. This makes it easy for anyone (even caregivers) to manage incontinence in a quick and efficient manner. There are exercises that can be used as a physical therapy component in line with Poise pads. These exercises can help strengthen muscles that have been weakened or damaged because of a medical issue. These exercises help increase muscle dexterity. These exercises are fairly easy and can restore a person’s ability to control their bodily functions. They are used to hold in your urine and can help you focus on retaining the strength of your bladder if you suffer from incontinence. Commonly called “Kegels”, this exercise will strengthen your pelvic floor muscles so you can hold in the urine. Women commonly experience pelvic floor muscle issues due to giving birth. While incontinence is more common in women than in men, it still can happen to any gender and at any age. Knowing the type of incontinence that you have will assist in giving you the best level of protection against it and to ensure that you are doing all that you can in order to maintain your dignity again. Don’t opt for a store brand or cheap pad when you can easily purchase some Poise pads to help you stay protected in the right way! Poise is sold online and it’s also found in many stores. Poise also carries several other fine products that may be more affordable for your situation. Poise wants you to have the best products for your incontinence needs. You should also work with your doctor to determine what types of products from Poise are most suited for your incontinence issue. Poise pads are some of the best on the market as they have multiple absorbency options, in addition to the other Poise products that exist on the market. Pads are the best for some people because they allow the wearer to be active and still be discreet about their incontinence issue. Adult pads from Poise should be a short-term solution or a long-term solution for most people. They are discrete enough to be stashed away in your glove box along with in your purse so you can quickly change them out if you have an accident when you are in public.